Sima Elizabeth Shefrin wanted to do something to contribute to peace in the Middle East. And she wanted to do something that would draw the world’s eyes to a just peace for both Arab and Jew. But words weren’t her thing. So she used colour, fabric and form to create the Middle East Peace Quilt with the help of hundreds of contributors from North America and Europe. Shefrin, a 52-year-old Vancouver-based fabric artist, got the idea in 1998. First she put the word out on the internet, then began asking for quilting squares through a course she teaches privately, on sewing arts. The finished product is a striking piece of art, as well as a dramatic cry for social change. Some 300 multi-coloured panels, composed of nine squares apiece, have images depicting peace in just about every shape, sign and form, including the 60’s peace sign, and Hebrew and Arabic phrases for peace. “The objective of the quilt is to get peace education out there,” explains Shefrin. “I hope it will inspires people (to work) for a just peace, a peace that is just for both the Palestinian and the Israeli. I would like people to think about how to facilitate that. The quilt will be shown Sundays in Toronto at the Winchevsky Centre, 585 Cranbrooke Ave. The exhibit begins tomorrow and runs till December 16 . In the wake of the September 11 tragedy, Shefrin feels even more strongly about her efforts to get people to talk about a lasting peace worldwide. Shefrin believes visual art and imagery can open doors that remain closed in other situations. And she’s hoping her quilt will not only spur debate, but help people take a small step towards ending hatred. Shefrin has been a fabric artist, arts curator and arts writer for more than 25 years. Much of her work has centered on her Jewish heritage. She is an active member of the Vancouver Palestinian Jewish Women’s Dialogue Group for Peace. One of her quilts was a portrait of Anna Columbo, a member of the Women in Black – a group of Israeli women who have demonstrated against their country’s settlements in the West Bank and Gaza. The Middle East Peace Quilt began touring two years ago and has been displayed in Vancouver, Portland, Oregon San Francisco, Los Angeles, Pasadena, Winnipeg, Fredericton and Victoria. The quilt is accompanied by messages and stories from its creators, and cross-cultural presentations by local Jewish and Arab groups. Shefrin and some of the creators will speak at the opening at 2 p.m. The exhibit is being co-sponsored by a number of Jewish and Arab groups including the United Jewish People’s Order, Yoisher: the Toronto Jewish Network for Social Justice, the Federation of Muslim Women, Palestine House, the Council of Jews and Muslims, and the Quakers’ Social Action Committee. The event has prompted much discussion among these groups, says Dr. Miriam Garfinkle, one of the organizers. 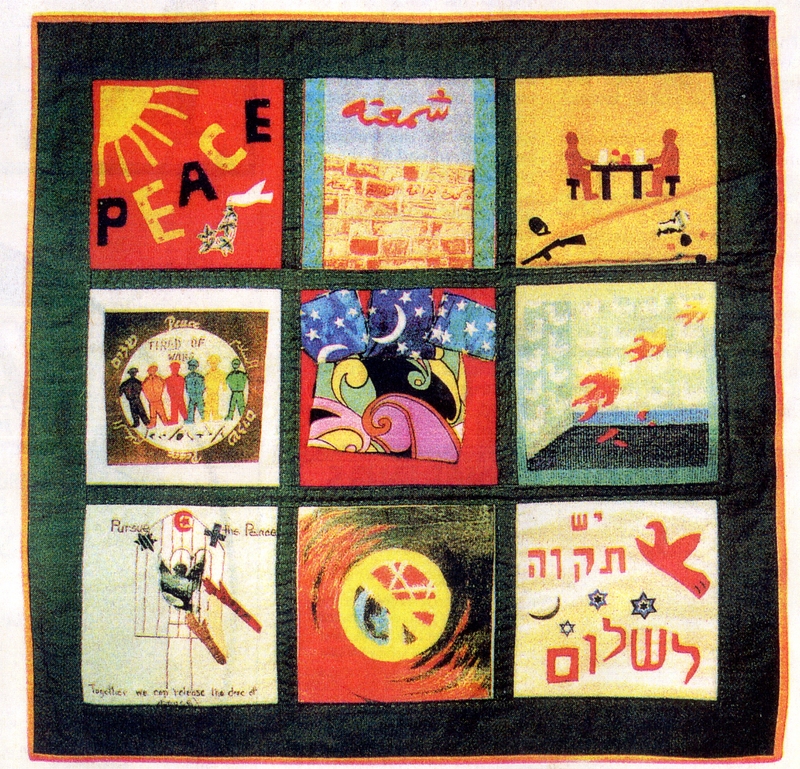 Each unique square in the quilt looks at the issue of peace from different perspective. One square shows two identical men sitting at a table upon which are coffee cups and food. On the floor beside one man is a gun and an army helmet. Beside the other man is a rock and Palestinian headgear. The message is that when people put down their weapons and identifying headgear they are exactly the same. Another square depicts the meeting of a Canadian Jewish woman with a Palestinian woman in a refugee camp. The Canadian woman made the square because she was so moved by her experience. A third square by a Palestinian Canadian woman is of a Palestinian woman and a Jewish woman with a big heart between them.